If in 1863 John Morrissey didn’t believe that change was necessary, Saratoga horse racing fans would be watching harness races and looking into the north at horses running instead of the south. The sun set in the west on another year of splendid Saratoga thoroughbred sport, the third season of 40 long days in its history and perhaps the second last remaining meet before the old plant gets a facelift. It’s about time. Average daily attendance dropped in most of the last 10 years and was up only marginally this year. This is something to consider when planning expansion. Renovation, however, is another issue. A good place to start would be to peel off the layers of paint that have caked on to the building and sandblast the splatters of white that some lazy worker let fall on the historic iron steps. How much would it cost to upgrade TVs or to make closed circuit messages audible? If NYRA spent only a few million dollars on basic spiffying up, most patrons would notice the improvement. Does an overall brush-up need to await Board approval? The franchise’s operatives, while single-minded and serious, are nonetheless conscientious. Now that money’s available, it’s time to get on with it. Regardless, even on its dreariest day, the nostalgic Spa racecourse recalls a bygone romantic era. The gr. 1 Hopeful, even after 107 presentations, is about as good a name for a stakes for promising two-year-olds as possible. And Currency Swap, a perfect two-for-two colt trained by Terri Pompay and ridden by Rajiv Maragh, won as if hope was for his opposition not him. In the gr. 3 Glens Falls, which came next, Emerald Beech won for the fourth consecutive time for trainer Jonathan Sheppard. Goldzar won at 31-1 for jockey Jaime Rodriguez, his first triumph of the meet, in the Ecclesiastic, a stakes that preceded the Hopeful. Eddie Castro, Julien Leparoux and Maragh each rode two winners. Steve Asmussen and Kiaran McLaughlin each saddled a pair. It may have been the 39th and final day, yet trainers Josie Carroll, Ramon Hernandez, Leah Germati and Randy Granger made the winning trainers list. In the past several years, watching the last few races from the grandstand was like watching TVG in your living room as the repo man takes away some of the furniture. Food stands began closing up shop by the fifth or sixth race. The hanging plants in The Carousel disappeared one by one even earlier. This year, you could feast at all food stations but Exacta Tacos to the bittersweet end and there were no ferns to steal – a proper shutdown. In the days and weeks that will follow there will be plenty of dreams realized. But Belmont Park or, for that matter, the new Aqueduct won’t match up to what just happened. Quite frankly, there is no comparison. 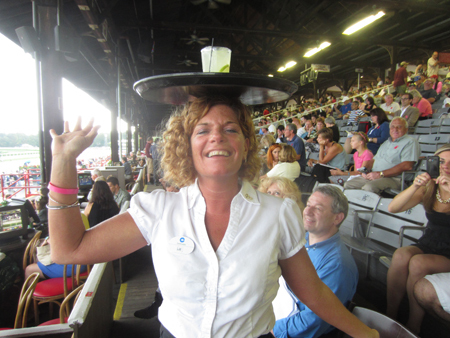 By the way, how does clubhouse box server Liz Hill of Saratoga Springs, NY balance those drinks on her head? You’ll have to wait until next summer to ask her. Caption: Clubhouse box server Liz Hill delivering a cocktail her own special way. 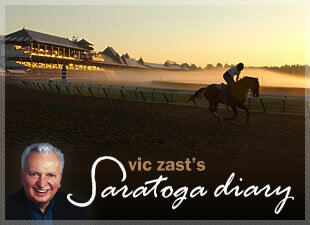 Vic Zast has ended his 48th season of racing at Saratoga.